Many intact grains are low GI, including oats, rye, barley, quinoa, amaranth, buckwheat, some rice varieties. Refined grain foods with a lower GI should be eaten in preference to higher GI varieties. Low GI refined grain foods include sourdough bread, pasta, low GI rice and some breads and breakfast cereals. 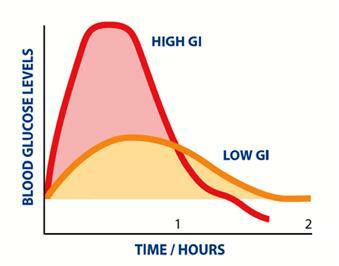 Aim to eat at least one low GI carbohydrate containing food at each meal and base snacks on low GI foods. For example, eating your breakfast cereal with low GI foods like milk, yoghurt, bran or fruit helps to lower the overall GI of the breakfast.